I’ve written about the Blackall Range before, but the adventure I’ve just discovered amongst its peaks is unlike anything I’ve ever experienced before. If you aren’t aware, the Blackall Range makes up much of the hinterland that makes this region of the Sunshine Coast so memorable, and is a huge tourism draw for us, with its breathtaking views and head spinning heights. The various bush walks and camping grounds are absolutely fantastic, with plenty of variety and top tier services, but what I’m talking about today is a little more rough, but a whole lot more extensive. 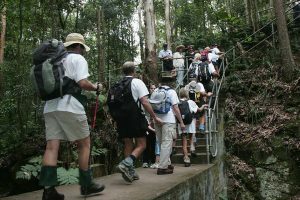 I’m talking about the greatest bushwalk the Sunshine Coast has to offer, aptly named the Sunshine Coast Hinterland Great Walk. The hinterland itself plays host to a full suit of half and full day bush walking treks, but this is a whole new level. 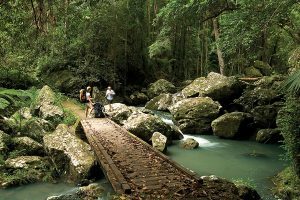 The Sunshine Coast Hinterland Great Walk is a four-day adventure through and around all the best elements that make the Hinterlands so great – experience it all, and camp under the stars. I decided to take on the challenge myself with some friends and it was absolutely unforgettable. Now we’re not exactly the fittest types, in fact you’re more likely to find us at the pub than on a treadmill or taking a walk, but we gave it a shot anyway. It wasn’t easy, that’s for sure. It’s a lot of walking, as one might expect, but the reward for all the blood, sweat and tears was truly worth it. Every bend in the treks lead us to a new and more beautiful area with something spectacular to experience, and at the end of the day, camped out with your mates around a fire, there is nothing more satisfying than looking back at how far you’ve come. 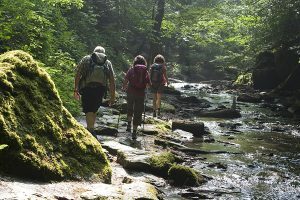 That isn’t to say this trek is only for hardened veterans of the realms of bushwalking, in fact we freely and frequently admit to being out of shape and having no business attempting this, so an average Joe who can keep up a walking pace for a while will have no trouble with this adventure. 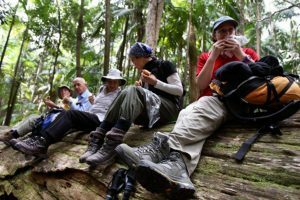 Jokes about my overweight buddies and I aside, it is an indescribably beautiful area, and this four day trek through the Sunshine Coast hinterlands is a fantastic way to explore its deep and vibrant beauty. If you’re looking for some adventure, and don’t mind a bit of mud and dirt and the occasional bug bite, then this may be the experience you’ve been looking for. For more information on the trek, the available facilities and map of the areas, visit the Queensland National Parks, Sports and Racing webpage.